← MFT Previews, Day 5 – Under the Weather? 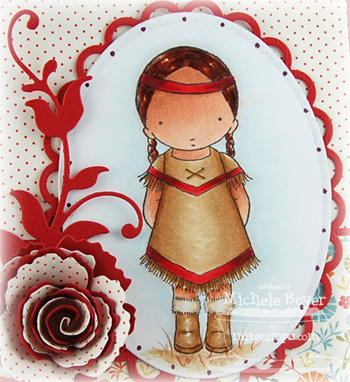 MFT Previews, Day 6 – My Teepee or Yours? Hi everyone! I’m back today with another March preview from My Favorite Things! It’s Pure Innocence day, one of my faves! This month we have Cowgirl, Cowboy, Indian Girl, Cute-a-tude, Puppy Girl and Precious Little Lamb Better Together. I love them all, but I really love Indian Girl. 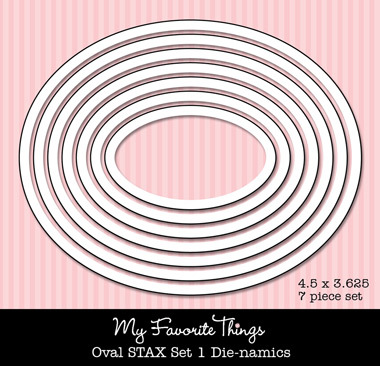 I first stamped her onto an oval shape die-cut with MFT’s Oval STAX Die-namics, a new series of nesting dies. 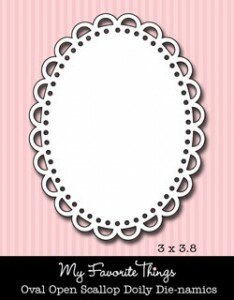 This month’s sets are the first in a series and they’re designed to layer with the large Oval Doily Die-namics. 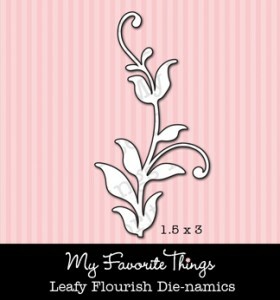 Each set contains seven pieces, retailing for $26.95, very competitive with other nesting dies currently on the market. 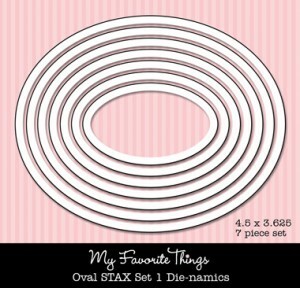 Here I’ve used one of the oval STAX Die-namics with Oval Open Scallop Doily. The dots around the oval were created using a wine Copic multi-liner. I broke out of my “norm” with skin tones using E11 as the base, shading with E13 with a bit of E15. 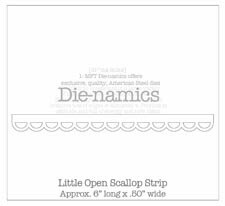 Also, along the bottom on the front, I’ve used Little Open Scallop Strip Die-namics. On the inside, I stamped another sentiment from the set along with a silhouette of the girl. You can attend the New Release Party on March 6th from 8-10 PM EST here in the MFT forum where you can enjoy fun, games and PRIZES! 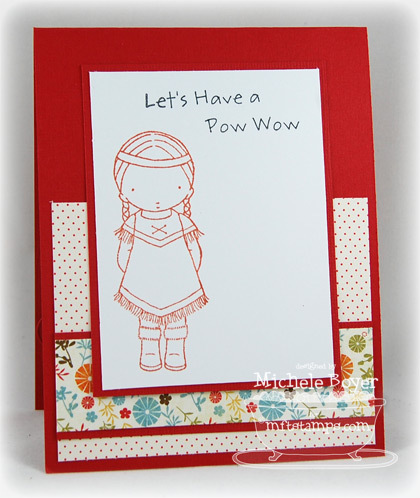 The MFT release, including all new stamp sets and Die-namics, will take place March 6th at 10 p.m. EST. You’ll find all the newest products here at release time. Teaser prizes continue so be sure to leave comments as you look! You can find direct links to all participating DT HERE. Each day, two prize vouchers are held by two members of our design team. You’ll have all week to comment on each of the posts and all winners will be posted on Kim’s blog on Tuesday, March 6th around 7:30pm. Stamps: My Favorite Things “Indian Girl” (Pure Innocence) Ink: Memento Tuxedo Black and Potter’s Clay Paper: Bazzill, X-Press It Blending Card, My Mind’s Eye On the Bright Side “One” (6×6) Accessories: Copic markers (E11, E13, E15, E18, E31, E33, E35, E40, E41, E43, R24, R29, R59, BG70, W00, W1), Prismacolor pencils, Copic Wine 0.1 Multiliner, My Favorite Things “Oval STAX,” “Leafy Flourish,” “Royal Rose,” “Oval Open Scallop Doily” and “LittleOpen Scallop Strip” Die-namics, foam boosters. Finished size 4 1/4″ x 5 1/2″. She is so adorable, love these bright papers (got mine sitting here, lol) and the new flourish die is so great. This is a great card, I love your color combo and I like both dp and plain paired together for the rose, so striking and gorgeous. The rose and the new leafy flourish are so good together. I love how you used two different design papers to make the rolled flower! Such a wonderful card I really love how you mad your flower! Love that flower… fantastic! Great card! That double rose is AWESOME Michele!!! What a clever idea:-D Your coloring is fab too, love how you’ve colored her dress! Love your card, beautiful colouring and how you layered the royal rose die. So gorgeous – what a fabulous flower! Awesome card. That flower is fab! What a great card! Love the coloring of her hair, and her dress is so well-done. 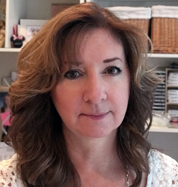 I love seeing your cards, & get so many ideas from you (like the double rose). Thanks for sharing! Gorgeous! Love the reds and your coloring on her is so pretty! Very cute! I SUPER LOVE how you layered the flower with patterned paper and regular! Very nice! how cute is this…lovin these new PI’s …great coloring! Love your coloring. her skin looks great. the whole card is good. Thanks for sharing. She is so cute, and I love that rolled rose! Great job! love it, love it! you copic QUEEN! Very cute. Love the way you colored her. that red just pops. Love the little indian girl with the polka dots and red. Really special. I love the red you used on this card! Really makes our little gal pop! love the dots! can’t wait for this rose die. lovley card Thanks for sharing. I LOVE the two-tone flower and your coloring is fantastic! The double rose is fabulous, Michele! As is the entire card! love the color really striking nice job. I love the flower with the two layers. After looking though everyones blogs I am going to have to add to my list I just love all you can do with it. LOVE the double rolled flower! That is SO awesome Michele! STUNNING coloring on her too! STUNNING! The red is just gorgeous. That flower flourish is an amazing addition to your card! So, so cute!! Love your papers and your colors. You did a great job on this image. LOVE this color scheme. The red really pops, and I love the ground/grass you added! Very cute! I love all the red! So very pretty. Love your coloring and the colors you used on the card. I love all the red! Your coloring is over the top! Love this adorable stamps! Oooooo…LOVE this!! GORGEOUS coloring you did on her!! (I sound like Yoda a little bit there…sorry) Love how you did the rose on this card….it’s BEAUTIFUL!! Gorgeous card!! Love your coloring! Hoy cow this is soooo cute – love your colors! Great card! Love the way you used 2 different papers for the rose! Need to try this! soooooo beautiful! love the reds you highlighted.